At least ten Egyptian soldiers are reported killed and dozens more wounded in a car bomb attack near the North Sinai city of el-Arish. Al-Masri al-Youm newspaper said a convoy of buses carrying infantry soldiers was hit by a roadside bomb as it moved through the Kharouba area. The death toll was likely to rise, a security source said. Attacks on security forces in the Sinai have increased since Islamist President Mohamed Morsi was ousted in July. No group has admitted carrying out Wednesday’s bombing, but the peninsula has grown increasingly unstable in recent years, triggered by the fall of President Hosni Mubarak. His overthrow in February 2011 left the northern Sinai prone to groups of jihadists, some with links to the Gaza Strip. In September security forces launched an offensive against Islamist militants in the Sinai, but have suffered a spate of deadly bombings. In recent months some 100 members of the security forces have been killed. Wednesday’s attack, which took place at around 07:45 local time on the road from Rafah to el-Arish, is thought to be the bloodiest against the military since Mohamed Morsi was deposed. Among the 10 who died were six soldiers, three security officers and the driver, the military said. Another 35 soldiers were wounded in the explosion which was said to have hit one of the two buses in the convoy. 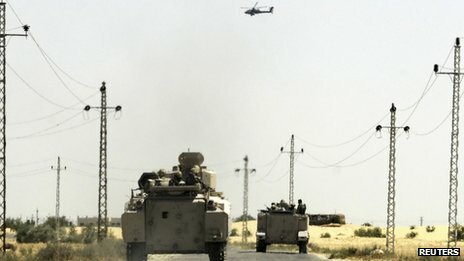 The attack is reported to have targeted Egypt’s Second Field Army, which has been deployed in Sinai and has been involved in an operation to destroy tunnels along Egypt’s border with Gaza. The soldiers were on their way back to Cairo on leave, reports said. Some of the most seriously wounded victims were being airlifted to hospital in the capital.